The Y-20 airlifter appeared on social media in PLAAF markings. 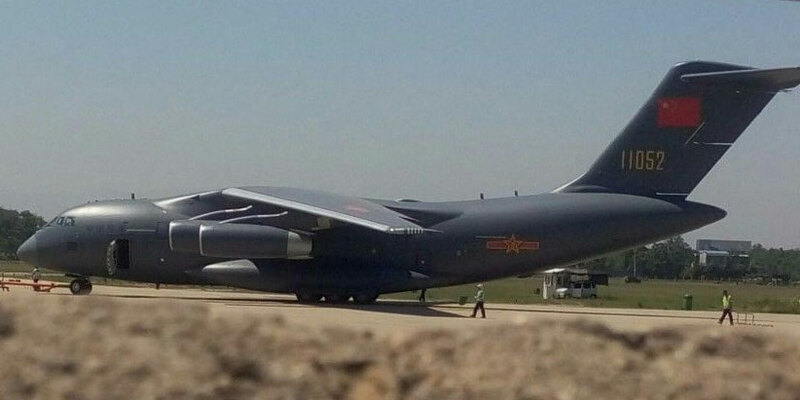 China has taken delivery of the first two Xian Y-20 strategic airlifters, according to photos published on social media. They show the aircraft in full People’s Liberation Army Air Force (PLAAF) markings at an undisclosed airbase. However, the serial numbers on the aircraft (11051 and 11052) indicate that they are assigned to the PLAAF’s 4th Transport Division, 12th Air Regiment based at Qionglai in Sichuan Province. The division comprises of three regiments based in the PLA’s Western Theatre Command, operating the Shaanxi Y-7, Y-8 and Y-9 transports. The Y-20 is a high-wing, T-tail four-engine design capable of strategic airlift. It was first flown in 2013 and made its public debut at the Zhuhai airshow the following year. Designed for short takeoff and landing (STOL) operations, the type is fitted with a modern glass cockpit and features significant use of composites to reduce weight and 3-D printed parts to reduce manufacturing costs. Its maximum payload is reported to be 66 tons, although this is possible only when higher-performance, high-bypass WS-20 turbofan engines currently being developed by the Shenyna-Liming company in China become available. Reportedly based on the WS-10 currently powering China’s J-11B Flanker combat jets, the WS-20 was first flown on an Il-76 engine test-bed at the China Flight Test Establishment at Xian-Yanliang in 2014. Until it is available, the Y-20 will be powered by the Russian Soloviev D-30KP turbofan used on the Il-76. The Y-20’s entry into service will fill a significant gap in the PLAAF’s airlift capability. It is also that the Y-20 could also be developed into an aerial refueling tanker in the future, with China’s Xian H-6 (Tupolev Tu-16) tanker being limited by fuel capacity and obsolescence issues. The PLAAF currently operates slightly more than a dozen Ilyushin Il-76 airlifters and three Il-78 Midas tankers, but its attempts to acquire more have been hamstrung by troubles finding suitable airframes for refurbishment.